The airflow of the big P2/P61 filter cartridge is from below to the top. This is a better airflow as gravity will assist in removing bigger particles like dust and oil droplets. All media used in a filter cartridge has its own dust. The white cloth filter in the filter cartidge is for trapping those media dust and oil particulate which forms into oil droplets. The oil in gas state will be removed by the Activated Carbon. The P2/P61 filter cartridge is 16 times bigger in media weight compared to a P21 filter cartridge. 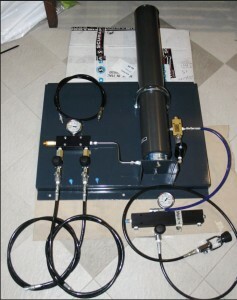 Air flow from a 200 liter per minute compressor moves very slowly thru these medias and contact time will be longer and with the additional PMV at the output of the P2/P61 filter tower, 149 BAR is the set pressure……..more Dwell Time or contact time for the air towards the medias is guaranteed. This is why I said there is no way a small P21 sized filter cartridge can clean compressor production air as good as a P2/P61 size filter cartridge. With the air movings slowly in such a big size of a P2/P61, less erosion will occur on the filter media and less dust generated. The quantity of the filter media and the size of a P2/P61 technically is superior over P21 in every way. Molecular Sieve used in an air purificiation application is a 13X type, this means the pore size is 10 Angstrom. This pore size is suitable for water molecule, hence the name being MOLECULAR SIEVE. We deal with water in a gas state and the size is molecular size. Sieve means storage. 10 Angstrom is 1 million times smaller than 1 millimeter. So do keep in mind, these are not real filters like a paper filter or particulate filter. These media are temporary parking spaces for gas molecules. Molecular Sieve and Activated Carbon are best imagined as honey combs with billions of small pores where the gas molecule will be parked. The suitable sized gas molecule will drop into those small pores and sort of “being captured”. Activated Carbon for air purification is of 5-10 Angstrom sized pores. Activated Carbon is not just a charcoal. It is a charcoal which is already ACTIVATED. By being activated means it is processed to create those pore sizes suitable for the gas to be trapped. Raw charcoal has big pores and very low adsorbtion rate. This is why Activated Charcoal is expensive compared to raw charcoal. Coconut shell Activated Carbon is choosen because it has the best suitability for 5-10 Angstom size pores called MicroPores and for gas phase. One cannot take lightly the risk if a wrong type of Activated Carbon is used. Common in the Indonesian market are Activated Carbons ( AC ) for liquid phase which has pores size of 100 Angstrom or more. One cannot tell which AC is for liquid phase or gas phase unless manufacturer labeled them as such and be honest about it. Molecular Sieve >> Activated Carbon. One must understand why it is done this way. The contamination from an oil lubed compressor is always water vapor and oil vapor, and some other gases which are the addetives used in the compressor oil. These gases are called aromatics. All compressor lubricants will have at least 5 types of addetives. One can’t see gas, usually its colourless but many gases can be smelled when the concentration is high enough. The smell one gets from a poorly maintained compressor or an expired filter cartrigde is the smell mainly from the compressor oil gassing off its addetives or if compressor gets too hot, it is oil burning. Now lets come back to the media arrangement. The molecular sieve is to trap all the water vapor first, so that the Activated Carbon ( and/or Hopcalite ) will not have any water vapor in them and can do its job trapping the dangerous gases. Remember, we are not talking of a particulate filter, we are talking of Activated Carbon which its pores are engineered to “store” dangerous gas and oil vapor. If water vapor were to hit the Activated Carbon, its pores will be clogged and what is already trapped can be released back to the air stream because Activated Carbon has more affinity for water vapor than other gases. Hopcalite will also be useless when water vapor is clogging it. This is a very sensitive chemical. Now it is obvious why Molecular Sieve “wetness” is the barometer for filter cartridge life, its function is very important to keep Activated Carbon and Hopcalite dry in order for then to perform proper air purification duty. Compressor manufacturer sized its media content or ratio based on a healthy compressor. An X amount of molecular sieve and Y amount of Activated Carbon. A worn out compressor will have 1 problem for sure, higher oil level in the production air due to the piston rings and liners already leaking oil vapor. Molecular Sieve will be able to adsorb 20% of its weight in water vapor. Activated Carbon can only adsorb approx 6% of its weight in oil vapor and other nasty gases. So, any dive operator who does not adhere to filter life table while owning a healthy compressor or a dive operator adhering to filter life table but with a worn out compressor, both will produce bad air. The pnenomena where the next tank suddenly smell so strong of oil, while the last tank was decently OK is because the molecular sieve is already saturated and water vapor overwhelmed the Activated Carbon. So the Activated Carbon is not only uncapable of trapping the oil vapor produced by the compressor, the water vapor pushed out all the nasty gases and oil vapor it has previously stored. This is double contamination volume suddenly introduced to the production air = very smelly & dangerous air. This is what happen to a P21’s PMV when a dive operator pushed filter cartridge life beyond the calculated limit. This is a very common occurence. Molecular Sieve when too wet will produce clay like ooze, it is after all zeolite based and clay is part of its chemistry. Activated Carbon when wet has a nasty reaction, it will produce sulphuric acid. This is the actual killer of the PMV internal. There is no way to fix a corroded PMV internal. Its internal acts like a piston liner and any corrossion will cause a leak. A Bauer PMV will need to be replaced as a unit and it is not cheap. The Moisture Disc 20 / 40 / 60 means percentage of humidity. Change filter cartridge at 20% humidity. When humidity is at 20% RH, the 20 light blue sector will become very light pink ( Lavender ). When new filter is installed, it will take 2-3 hours of compressor running to bring back the light blue color of 20% sector from light pink. Use hair dryer if you want to speed up drying. 0.040 gram is 40 milligrams. Water content at 200> BAR is 35 mg/m3. Since we are not in the tropics, we do not worry of regulator freezing but we must make sure the Hopcalite and the Activated Carbon remain dry to do its job. 20% at 149 BAR is 0.13% 1 ATM equivalent. So 20% sector on the Moisture Disc is a good indicator for end of filter life based on the Molecular Sieve dryness limit. When P2/P61 is showing 3000 PSI ( 200 BAR ) , the 20% reading of RH is equal to 20/200 BAR or 0.10% RH at 1 ATM. You make your own call if you want to choose 2,200 PSI or 3,000 PSI. 2,200 PSI and 20% RH is a safe value. Estimate of filter life P2/P61 size at 38C processed air temperature. This calculator is supposed to have end of filter life at -55C Dew Point. We are targetting -48C Dew Point. 84 to 90 hours of use is feasible for 30C ambient temperature.